The authors describe methods to quickly acquire NUS-assisted 2D spectra that are suitable for qNMR. Using NUS methods achieves resolution enhancement with little time penalty, compared with US acquisition. 2D HSQC/TOCSY NMR has a great potential to improve the resolving power of mixture components, thereby assisting assignment and quantitation by area measurement. NMR is a powerful tool for the analysis of complex mixtures and the identification of individual components. Two-dimensional (2D) NMR potentially offers a wealth of information, but resolution is often sacrificed in order to contain experimental times. 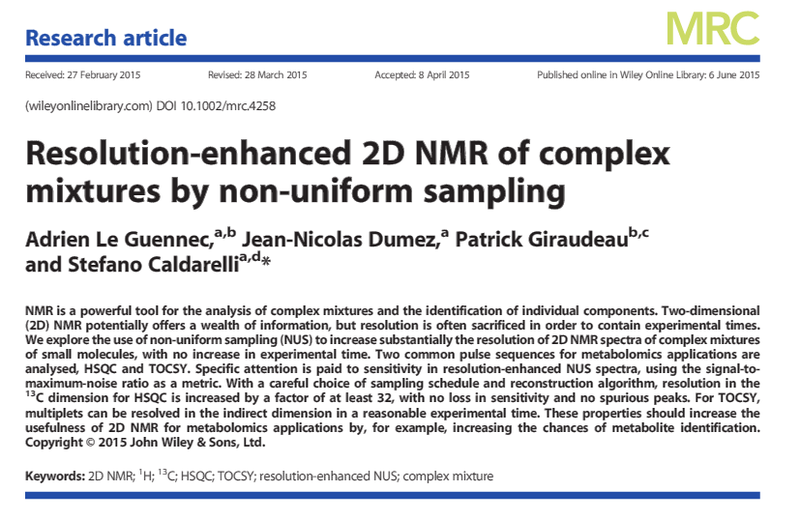 We explore the use of non-uniform sampling (NUS) to increase substantially the resolution of 2D NMR spectra of complex mixtures of small molecules, with no increase in experimental time. Two common pulse sequences for metabolomics applications are analysed, HSQC and TOCSY. Specific attention is paid to sensitivity in resolution-enhanced NUS spectra, using the signal-to-maximum-noise ratio as a metric. With a careful choice of sampling schedule and reconstruction algorithm, resolution in the 13C dimension for HSQC is increased by a factor of at least 32, with no loss in sensitivity and no spurious peaks. For TOCSY, multiplets can be resolved in the indirect dimension in a reasonable experimental time. These properties should increase the usefulness of 2D NMR for metabolomics applications by, for example, increasing the chances of metabolite identification.